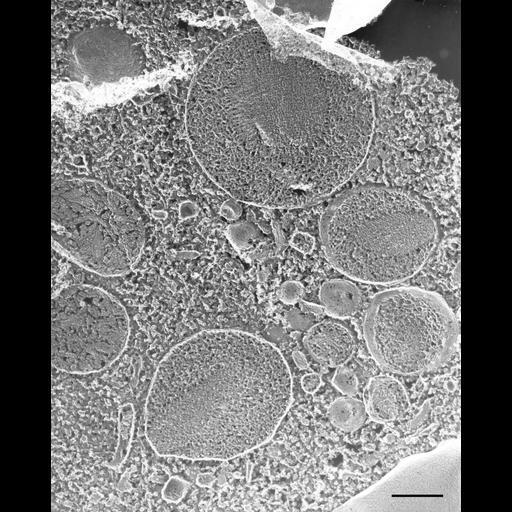 Larger vesicles contain paracrystalline cores that are associated at one end with the trichocyst membrane. This may mean that there is a site on the membrane that promotes paracrystalline formation or that such an association somehow leads to the asymmetric elongated final shape of the trichocyst. TEM taken on 6/7/88 by C. Schroeder with Zeiss 10A operating at 80kV. Neg. 15,900X. Bar = 0.5µm.